A lightning strike amongst the mountainside lodgepole pines in the Sawtooth National Forest on Aug. 7, 2013, ignited the Beaver Creek wildfire that burned through nearly 115,000 acres in central Idaho’s Sun Valley. The concern has since turned from fire to flooding, as the scorched, denuded landscape can do little to slow down the runoff from summer thunderstorms. A new precipitation monitoring network from the U.S. Geological Survey and Blaine County will give weather forecasters and emergency managers valuable new data to warn homeowners of potential flash floods and debris flows form the burn area. The Beaver Creek Fire’s hot burn led to dramatic effects on the mountain slope soils, according to Dave Evetts, project chief and assistant director of hydrologic data with the USGS Idaho Water Science Center. That proved to be the case only a month after firefighters contained the fire. Exceptionally strong storm in September triggered flooding and thick mudslides in the Wood River Valley and side-canyons like Greenhorn Gulch and Croy Canyon. Debris flows blocked roads and damaged houses. 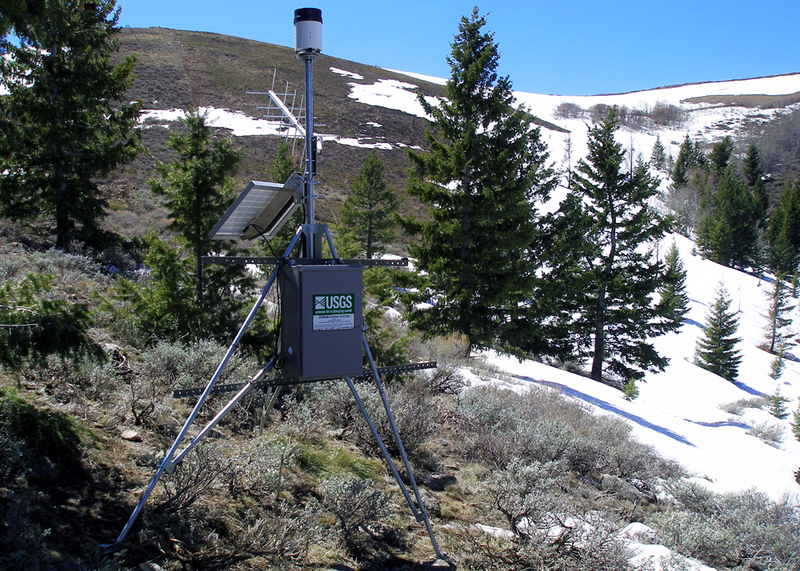 The network of six rain gauges installed along ridge lines will provide real-time precipitation data in the burn area, where rainfall observations are otherwise sparse. Each station includes a tipping-bucket rain gauge, solar panel, data logger, battery and antennae. The stations will broadcast precipitation measurements online every hour until they detect that a rain event has begun. Then they’ll ramp up to taking measurements every five minutes. The National Weather Service will use the data to issue warnings and alerts based on their criteria, Evetts said. That will benefit communities including Hailey and Ketchum, resort towns that draw tourists for skiing and other outdoor activities. The data is also available to the public through an interactive map on the USGS website. Though the USGS has precipitation networks in other states, this is its first in Idaho.